A full page appeared on Stephen Skinner and his work. STEPHEN SKINNER, THE AUTHOR of Feng Shui Style, is taking some time off from his busy schedule of book signings, talks and a full-blown book launch. He sits at a table where cups of half-drunk coffee and torn sachets of sugar and creamer share the space with a pile of coffee table books. Hidden behind these objects is an important tool of his trade as a feng shui lecturer and consultant — a large compass with minute Chinese characters etched on its broad brass disc. 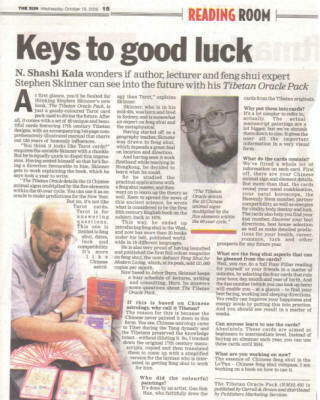 Speaking in a clipped English accent — something that throws you off the fact that he was born and bred in Sydney — Skinner explains that in China, magnetic compasses were used to make feng shui readings much earlier than they were used for navigation. Literally translated as “wind and water”, feng shui is the ancient Chinese science of harnessing the flow of energies or qi, which is viewed as a source of prosperity, health and honour. A complicated instrument with concentric rings containing feng shui information, the lo p’an is considered the complete encyclopaedia of feng shui formulas. “In Taiwan they can go about a metre wide. For rapid use, I use this one, a modern Hong Kong compass, where there is no needle,” says Skinner, who owns a sizeable collection of these instruments. In Shanghai, Skinner even acquired a Ching Dynasty lo p’an from an antique shop, whose owners were blissfully unaware of what they had sold him. “They thought it was a navigational instrument. I didn’t tell them what it was and just bought it,” he says, rather pleased with his find. The practice of feng shui was suppressed on the Chinese mainland in 1927, but survived in Hong Kong and Taiwan, so many of the populace on the Chinese mainland grew up with little knowledge of this integral part of Chinese civilisation. Recognised as the man who brought feng shui to the West, Skinner oddly enough started off his career as a geography lecturer in Sydney. He has written more than 20 academic titles on the subject, translated into 16 languages including Chinese and Russian. “I first came across feng shui in 1976. I was in Hong Kong with a Chinese friend of mine, a barrister,” he recalls. Skinner’s training as a geographer drew him to learn more from the master, since feng shui places a lot of importance on location and direction. He followed the master on his rounds and learned feng shui interpretations firsthand. Skinner supplemented this practical training by immersing himself in feng shui theory. He went to London where the best collection of feng shui documents from colonial times are kept and began studying the classics, a dictionary in hand. “Previously in 1974, I learned to read Mandarin, old characters of course, but not to speak it. “As a geography lecturer, I used to share my office with a lecturer in Chinese and she had a file of flashcards. I absorbed the characters, plus meanings and the Wade-Giles transliteration but never the sound in Mandarin. “I can read and not know what the sound is like. I can read classical texts but not a modern Chinese newspaper because of the simplified characters,” he says. His passion resulted in the publication of his first book in 1976, called Living Earth Manual of Feng Shui. However, the title was continuously in print for 28 years, published in both Singapore and London. Even years later, when he left the academic world to pursue a career in publishing, Skinner did not abandon his passion for feng shui. In 1997, Skinner approached his then boss and suggested that he publish a magazine on feng shui. When his suggestion was met with unenthusiastic response, he decided to strike out on his own. The result was Feng Shui for Modern Living, the first full colour magazine on Chinese geomancy, featuring full colour pictures and lots of celebrities who were interested in the ancient science. During its peak, the magazine had a circulation of around 120,000 and at one point even outsold Elle Decor! By paving the way, Skinner wanted to show that feng shui can very much be part of decor — that good style and good luck are not incompatible. Though short-lived, having ended its run on the 30th issue, it did attract a lot of attention — he was contacted by a publisher in Taiwan who bought the rights and re-published the magazine in Chinese. If there was some irony, Skinner was nominated Publisher of the Year for the PPA Awards for publishing a magazine no one wanted to publish. As a geographer, he believes that feng shui application is very concrete and physical. “If you make changes in the position of water and particular elements, you will get very specific results. For example, my friend’s office. He had two clients in six months. After changes he had more clients. “In the West, luck means winning a lottery. In feng shui, you can change luck — it means opportunity. Qi in the right place means luck means opportunity,” he notes. “Feng shui in the West is turned into a bit like interior decor, which is partly my fault. If you explain that some of the most beautiful homes and hotels are built according to feng shui techniques, people sit up and take notice. People in the West and even here are success-oriented,” he says. His latest work showcases some of the best homes and buildings built with feng shui principles in mind. Among those featured is China White, a famous and expensive London nightspot, a favourite hangout for Madonna and Michael Jackson. Also featured in Feng Shui Style is the much-renovated home of KL-based architect, Professor Jimmy C.S. Lim, as well as Chef Wan’s lavish penthouse. So, what does good feng shui mean to him? He adds that two factors are important when looking at feng shui in the home — using the best parts of the home and the placement of water. Instead of making dozens of small changes, he feels that one should make one clear change based on feng shui principle. “Record the date of the change in your diary and see what happens. If nothing happens, then you have not done the right thing. And Skinner is one expert who practises what he preached. When he moved his base to Johor Baru from London a year ago, Skinner took his time in selecting a home in harmony with feng shui principles. “I drove the real estate agent mad!” he says, as most of the houses he was shown did not meet his stringent specifications. It was only when he was shown a penthouse once owned by a Chinese family that he was satisfied with the feng shui — the previous occupants had had the home properly aligned by a master. At least for Skinner, good qi is worth all the trouble.